Only two months into the new year and there is a lot to report. First, there are a few changes to the Board of Directors and Executive Committee to report: Mike Trudeau, (GM at Bigwood Event center/Country Inn & Suites) has been added to the Board; welcome Mike and thank you in advance for your willingness to volunteer your skills to the organization. Two changes to the Executive committee have occurred as well. Steve Schoeneck has been our treasurer and chief financial person for the past three years; however, Steve was appointed to the City of Fergus Falls Port Authority Board and he is also on the Board of Greater Fergus Falls besides working more than full time at Otter Tail Power Company. Steve, thank you for your help with FFDRC but also thank you for stepping up to serve on the Port. I know your talents will benefit the City, Greater Fergus Falls and FFDRC. As Steve is stepping down, we are fortunate to have Kadie Schroeder on the Board willing to take over for Steve and move up to the Executive Committee as the Treasurer. Another Change on the Executive Committee, also due to a heavy work schedule, is that Dan Mohagen is resigning from the Executive Committee but will remain on the Board. Dan Mohagen and Patrick Lundberg have started Outstate Brewing Company with the new brewing facility under construction now, located roughly at Vine Street and the Otter Tail River. The brewery construction and operation will require more of Dan’s attention so he is stepping down to the Board level and will still be active with FFDRC. Replacing Dan will be Kelli Frieler who has made major contributions as a Board Member. I know that Kelli is excited to be on the Executive Committee and I can’t think of a better addition. We are so fortunate to have so many talented volunteers willing to spend some (a lot) of their time to help FFDRC and the community. The Executive Committee is now made up of Steve Eriksson, Steve Rufer, Shawna Shale, Sue Wilken, Kelli Frieler, Kadie Schroeder and our Administrator NeTia Bauman. Additional Board Members are Laurie Mullen, Jim Danner, Jeff Stanislawski, Eric Price, Tom Kingston, Wayne Hurley, Chris McConn, Bob Worner, Richard Smestad and Dan Altenbernd. A “retreat” was held in January instead of the regular Board Meeting, which allowed the Board members to spend a long time discussing how we operate, what we accomplished in 2018 and what we want to accomplish in 2019. Events continue to be our priority and we will add one or more to those we already have been promoting. 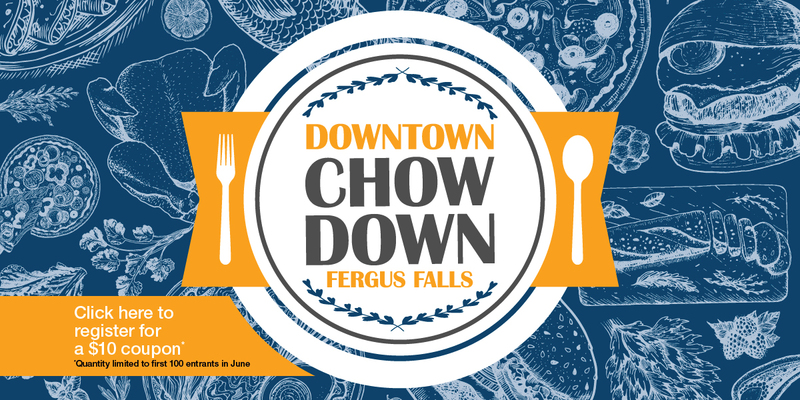 Planning for Downtown Chow Down will begin the week of March 11th and Over the River in April. Michael Burgraff is planning on five live music events on Lincoln Avenue during the summer months that will be partly sponsored through an FFDRC contribution to A Center for the Arts. I will fill in the blanks later about upcoming FFDRC sponsored events, but I am excited to inform you of a new event that will occur on April 11th. At the request of the Mayor, FFDRC together with Visit Fergus Falls, the City and the Chamber, will sponsor the State of the City (“SOC”) address in Downtown Fergus Falls. The intent is to include as many people in the community as wish to be included, so it will be held at A Center for the Arts as well as being live broadcast via radio, television and as a live stream. The SOC will begin at 7:00 P.M. so most of the community can participate in person or via one of the forms of media. Following the SOC address, the community is invited for a reception with Hors d’ oeuvres/dessert at the Senior Center across Lincoln Avenue from A Center for the Arts. The SOC and reception will be free of charge but seating is limited so you must obtain a ticket; however, seating will be on a first come first serve basis with a ticket. The program will begin promptly at 7 P.M. with doors opening at 6:30. Tickets are available at A Center for the Arts, City Hall, or online at Fergusarts.org. If you have difficulty please contact me or NeTia and we will do what we can. Now that the site has been purchased, the next steps are to demolish the buildings, clean up the site and remediate any identified contamination. Loan and grant applications have been written and provided to the Minnesota Department of Employment and Economic Development (“DEED”) for demolition and environmental cleanup funds to be used on the site. We are hopeful to receive a positive answer for this potential funding by the beginning of April 2019. Over the River Holiday Festival is scheduled for December 7, 2019 with the initial planning meeting in early April, although an exact date has not yet been set. It will be hard to top Over the River 2018, but I am quite sure the event team is well capable of achieving the goal. The event team is always looking for new ideas as well as volunteers, so If you would like to help plan the event or have ideas to share or just want to be involved please contact NeTia at netia@ffriver.org. We would also like to secure our sponsorships early so please let us know if you can help out financially or know someone that will; again, contact NeTia. Chow Down 2018 was highly successful and so we intend on a “sequel” to be held during the months of June, July and August this year. I can’t wait to hear about the contest for the “Golden Chicken Leg Award”. The first planning meeting will be on March 11th. If you would like to participate in any manner contact NeTia. Thank you to all that have sent in 2019 dues and thanks in advance to those that are about to; we depend on our membership financially but also for the community support it represents. If possible, can each of you reach out to someone you know that shares our vision to see if they would support FFDRC by becoming a member? I have attached a Membership application with this email. The application can be filled out and mailed in together with a check at the desired membership level. Are you, or do you know of anyone that would be willing to help FFDRC a few hours a week with various tasks including research, maintaining our Web Page and marketing through social media? If so, please contact NeTia at netia@ffriver.org. The FFDRC supports this major project as we believe it will make a large contribution toward the Mission of FFDRC. Attend, listen or view the State of the City address to hear what’s happening with this City project. Board meetings are held the first Tuesday of each month at Cooper’s from 4:00 to 5:00 P.M., all are welcome to attend. The next Board meeting date is March 5, 2019. If you have a comment, a concern or an idea of what we can do, or do better please email me at steve@ffriver.org or call me at 952-513-0158.